I have a growing tendency to embrace my 'mistakes'. I find that there's is something electric in a moment that wasn't supposed to happen. Something unexpected. A shoot that lost it's focus. A movement. 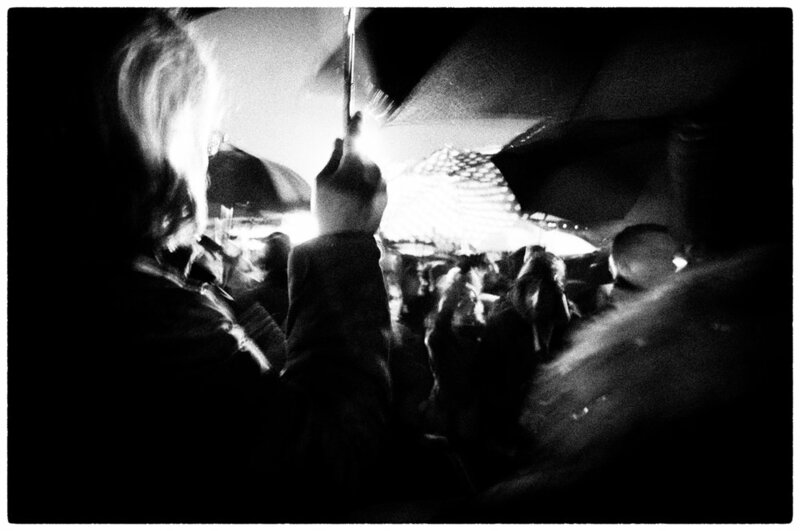 Lights, people, wind or rain. Anything can happen and if I’m lucky, it all adds up to simple magic. The one thing that attracts me to photography is the chase for split seconds. What we do is basically catching something that can not be recreated. We can rehearse, arrange, plan, repeat, do a lot of things to be as prepared as possible, but once the camera starts shooting, there's no turning back. It's in the eyes, the lips, the posture, the light. Everything is momentary. Everything will change. My mission is to try and catch the best parts. A 'mistake' is the essence of of all of that. It's unplanned, unrehearsed and it's impossible to recreate by its very nature. A 'mistake' happens on its own and for a second I become an observing bystander, browsing through peculiar pictures wondering who took them. And sometimes they turn out to be magical. Like the light surrounding this woman's finger. Or the hooded man crouching on the right side. What is that light? Who is he hiding from? When I embrace my mistakes untold stories emerge, the world looks different and for a split second life turns infinite.